On Jan. 7 at 3:52 p.m., patrols conducted a motor vehicle stop on a green Dodge Neon for a cracked windshield violation in the parking lot of CVS (520 Stokes Road). Upon their approach of the vehicle patrols could detect an odor of burnt marijuana coming from inside of the vehicle where two occupants were seated. After a search of the vehicle on scene was conducted patrols uncovered two unopened packages of Suboxone sublingual film, one open and empty package of Suboxone sublingual film, and a red cap containing a metal pipe with residue. The driver was subsequently taken into custody and transported to the Medford Township Police Headquarters. He was charged with possession of CDS, possession of CDS paraphernalia, possession of CDS in a motor vehicle, and a cracked windshield. 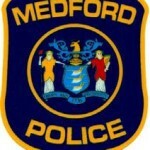 He was processed and released on a summons complaint pending his court appearances in the Medford Township Municipal Court.